IRCSL Chairman Asite Talwatte set the tone of the workshop on ‘Integrated Reporting: Moving Beyond the Basics’ by sharing statistics on the steady growth of integrated reporting adopted by corporates in the country. “In 2014, we saw about 20 companies adopting the integrated reporting framework, however this number increased to nearly 50 companies by 2018,” he said. Yet, despite the progress in terms of the number of companies adopting the framework, Talwatte noted that what remained debatable was whether companies were also readily embracing integrated thinking at management and board level discussions which is vital if organisations are to enjoy long term sustainability. Integrated reporting and climate change are seen as the perfect marriage to address important sustainability issues as it goes beyond conventional financial information, thereby helping create value and sustainability, all while helping organisations play a more responsible and valuable role. With Sri Lanka currently suffering from daily power outages and regular waters cuts, CA Sri Lanka President Jagath Perera highlighted the important nexus between safeguarding resources and the role integrated reporting and integrated thinking. “These power and water cuts finally burns down to how we manage our resources, and therefore, integrated reporting is an important framework which will tell you how you can manage these resources for the future generations as well,” Perera said. Integrated reporting is a stark contrast from conventional financial reporting due to the forward thinking strategy the framework adopts to push organisations to understand the need for long term value creation encompassing financial statements, management commentary, governance reports, environmental and social impacts as well as corporate communications. 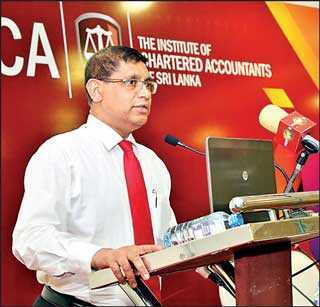 According to Raja Senanayake, integrated reporting is nothing but communicating that story of creating value for all the stakeholders of a corporate in the short, medium and long term. “Let’s admit one thing at the outset. Given the diversity of audiences and their conflicting interests, producing an effective annual report is not easy. Given that too much information, not well told results in the reader being unable to see the wood for the trees. At the same time, too little detail, however well told, gives the impression of information being withheld. 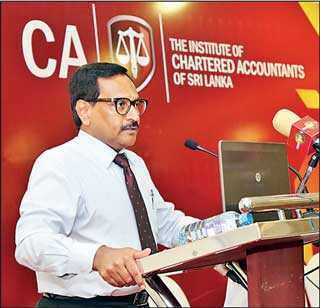 Report preparers need to strike that delicate balance between compliance and communication,” Senanayake who serves as the Head of Process Development at Smart Media Ltd. said. With the onset of certain external developments, such as globalisation, digitalisation, exponential technologies such as AI, robotics, blockchain and hydrophonics, unorthodox competition and demographic changes, Senanayake who delivered the keynote speech at the event emphasized that most longstanding and widely held assumptions about markets, competition and even business fundamentals are less valid today. “These developments are challenging conventional business models and having a profound impact on their sustainability. It is no longer business as usual. As a result, they are making historical financial performance of a corporate less relevant for any assurance about its future potential. Future potential has to be evaluated on its own merits. This is because historical performance deals with only the financial value created which is the net outcome of value delivered to the various stakeholders and value derived from them. But, the emerging developments have made the entire story of delivering value to and deriving value from stakeholders important today,” he said. Therefore, Senanayake noted that companies need to report on the initiatives undertaken to deliver value to customers, employees, investors, business partners, regulators, society and environment as well as those initiatives they are planning to implement in future. With companies only simply reporting on historical performance unlikely to inspire confidence among the stakeholders, he urged corporates to practice integrated thinking and make the business model more sustainable. Another important fact according to Senanayake was for corporates to narrate their story using integrated reporting by raising awareness of the emerging developments, while highlighting the strategies the corporate is adopting to evolve. “Ultimately, it’s all about delivering the value to stakeholders and deriving value from stakeholders,” he added. With the increasing need for corporates to interweave integrated thinking into the IR framework, the important role of the c-suite was also highlighted during the workshop. According to SheConsults Ltd. Director Aruni Rajakarier, changing the mindset and the skillsets are important in embedding integrated thinking while driving forward integrated reporting. Rajakarier noted that one of the most pertinent issues in an annual report is the overload of information. Sharing an analogy of an air traffic controller’s role to an annual report, she said that instead of reporting details of the planes in another country’s airspace, the air traffic controller must only focus on the planes landing and taking off in his respective airspace. “So, basically, you should report what is in your airspace, not what is outside your jurisdiction, because that is not your responsibility,” she noted. KPMG Partner Ranjani Joseph highlighted that as a relatively new framework, IR was still evolving and therefore the assurance factor on integrated reporting also needs to evolve alongside the practice of reporting itself. “But, it’s a long journey, and there is a lot of improvement that needs to be done both from the assurance providers perspective and prepares perspective and ultimately give credibility to all what we are reporting,” Joseph added. The workshop also touched upon how technology can be an enabler in helping facilitate integrated thinking among corporates. Ernst & Young Senior Manager Financial Accounting Advisory Services Hathim Sabry believes that technology will play a critical role in the context of modern business and integrated thinking. To reach this goal, he emphasised the increasingly need for CFOs to look beyond financial information, and to make decisions based on data. “CFOs need to make sure processes and models and the digital technology models and automation is captured properly, because all of this affects how value is derived and value is consumed in a business,” he said. Forestpin Ltd. Director Dilanke Hettiaratchi also continued on the important role technology can play in terms of the IR framework as well as integrated thinking. He was of the view that analytics and alerts can be hugely beneficial in providing accurate information, while also saving time and money and most important helping make informed decision on strategy. Another benefit of analytics and alerts was the reduction in operational risks, he says. The detailed presentations by the resource personnel was followed by a panel discussion. Sharing her views, panellist Prof. Samanthi Senaratne from the Department of Accounting of the University of Sri Jayewardenepura was of the view that integrated reporting has filled an important vacuum by helping stakeholders understand the integration among different activities of an organisation, including understanding the key value drivers. “So it is important to look at what extent we are using the framework at a managerial decision level,” she added. Joining the discussion, University of Colombo Senior Lecturer in Accounting Dr. A. A. C. Abeysinghe said that at the end of the day for a company to be sustainable it was important to maintain relationships with all stakeholders. “As a company if we are to be sustainable, we must maintain a good relationship with all stakeholders. So, basically managers are the nexus in keeping these relationships going with all stakeholders, whether they be investors, employees, and even suppliers,” he said. At the conclusion of the panel discussion Talwatte proposed to set up a LinkedIn page to help share experience and views on integrated reporting.